Collecting moments with friends made simple. Automatic. Kolektio lets you collect photos within a given period of time (moments). With Kolektio you will never lose a photo again. Especially when we are participating at events, weddings, parties, and so on and taking pictures with other people. Kolektio lets you share your moments automatically within a group of people. If you are looking to a private way of photo sharing, Kolektio is the solution for your needs. You take a picture from the standard camera app of your phone, and all the rest happens in the background. We make photo sharing simple, private and automatic. Simply tap a button to print your favourite pictures! With the print shop, you can now print the photos of your favorite moments in a single tap and have them delivered to your house. You can choose amongst different print types: Phone and Tablet cases - Frames - Photo Books - Posters - Stickers - Magnets - Cushions - Bags. Kolektio Helps Friends Capture Moments Together in Shared Albums. Kolektio is Instagram for events and networking. 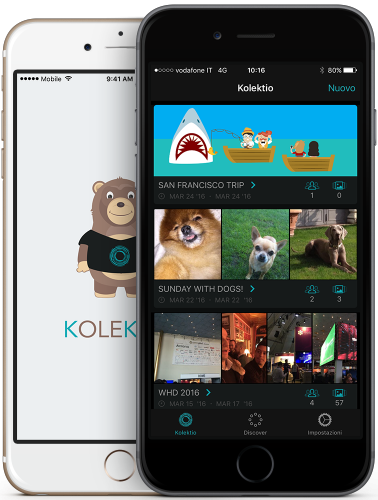 Kolektio helps capture and share moments among friends. Facebook Inc Unveils Moments App and the critics say that the concept of the application is similar to that of Kolektio app which was launched less than a month ago. Kolektio Special Edition Mille Miglia 2015: share the race's pictures using the app. Take photos with your favourite camera app, and Kolektio will do the rest in background. Decide which of your files are shared with other “moment's” members. Turn your favourite memories into canvas or posters directly from the app. Add your friends to the "moment" directly from your phone contacts. Simply tap a button to print your favourite pictures on different formats and items! With likes and comment you feel even more involved. Easily download your moments file in local storage whenever you want (not with the free plan). Safe european datacenters, we take care of your files.